Beet juice is wonderful for your blood and its not just because of the color. As mentioned on the page about the benefits of juicing beets, beets are very good for the blood and for relieving many cases of anemia. There are cases of people who had symptoms of anemia and tried all sorts of remedies and medical treatments with little result who then started juicing beets and found relief. The content of iron in beets is not extraordinarily high but there is something about the availability of that iron that makes is especially effective. Following is an article reproduced with permission of AIM International Inc., Nampa, Idaho. New studies show the benefits don't stop there. Recent research has found that the increased blood flow can have a positive impact on brain health, too. Scientists at Wake Forest University in Winston-Salem, North Carolina, determined that the increased blood flow to the brain due to beet supplementation improved brain health and helped lower the risk of dementia. Their study involved participants age seventy and over who alternated between breakfasts high in nitrates (a naturally occurring form of nitrogen) and low in nitrates. Measurements of each group of participants showed that the high-nitrate diet boosted blood flow to the white matter of the frontal lobes, a location often associated with dementia. The brain boosting power of beets goes right along with a long list of other beet benefits. For example, an improvement in circulation brought on by beet nutrients correlates to a lowered risk of high blood pressure. And not to mention the fact that beets increase the body's production of glutathione, which helps with detoxification. The list goes on, and the benefits can be traced to the remarkable amount of nutrition found in this vegetable. Not only do you receive the benefits of concentrated nutrients you also receive the full benefit of easy assimilation. 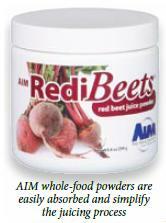 AIM RediBeets® provides the juicing benefits without the juicing cost. One of three all-natural, vegetable juice powder concentrates that make up the AIM Garden Trio®, RediBeets packs a half pound of beets into a single serving. Combined with the benefits of barley and carrots, the Garden Trio provides a full range of vitamins and nutrients that can get your blood flowing and boost your brain power. That article gives some great points about the benefits of juicing beets. If you would like to obtain the benefits of beet juice without all the mess and fuss of juicing yourself, consider AIM Redibeets. Read about the tremendous nutritional value of beets. Read about the many great benefits of juicing beets.